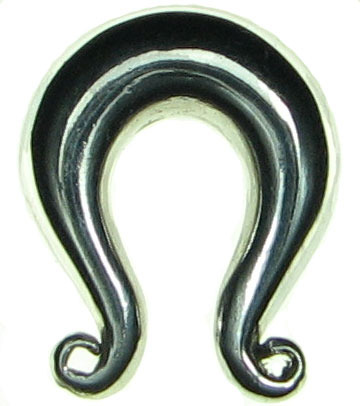 This Fine Silver Hmong Style Omega Septum Pincher is a great piece of jewelry for your septum piercing, or for earrings. These Silver Hmong Omegas are sold individually, so if you want a matching pair for earrings, please add a quantity of "2" to the shopping cart. 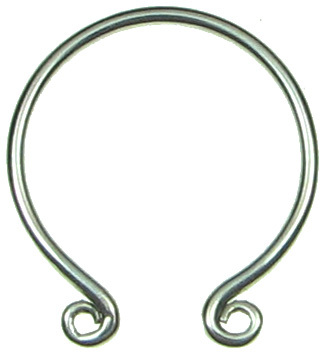 If you just want one piece for your septum, then add a quantity of "1" to the shopping cart. Rather than mass-manufactured, these traditionally designed Silver Omegas were made by hand, so some variation (such as exact size and shape) is present from piece to piece also from the Omega shown in this photo. Actual size of Septum Pincher may vary up to approx. 1/2 size from size listed. For example, if you select a 7 gauge Septum Pincher, the actual size may be smaller than 7 gauge but bigger than 8 gauge. The 18 gauge Omega has about 15 or 14 gauge curls at the ends. The 15 gauge Omega has about 13 or 12 gauge curls at the ends. 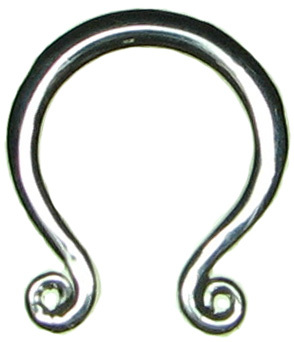 The 13 gauge Omega has about 11 gauge curls at the ends. 12 gauge size and larger all have curls that are the same size as the wearing surface, or a little smaller, for easier insertion. 6 gauge (+$27.00) 4 gauge (+$34.00) 3 gauge (+$41.00) Select your gauge size and click "Add to Cart".